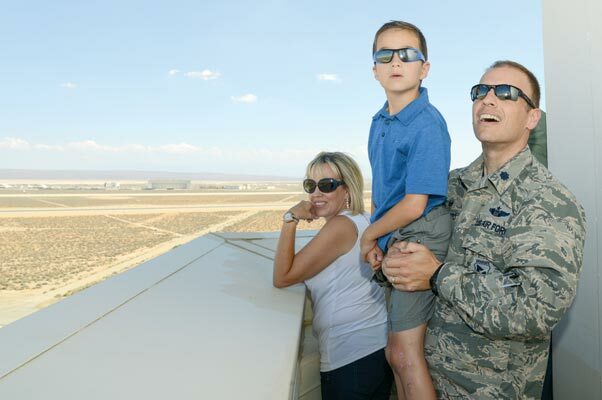 Lt. Col. Mark Massaro, 412th Operations Support Squadron commander, gives young Vincent a boost to watch a jet fly past the Edwards tower. Vincent attended the tour with his mother, honorary commander Ronda Perez (left). The 2015 honorary commanders were welcomed back to Edwards July 10 for a look at the flight test mission. he tour, hosted by the 412th Operations Group, showcased the 416th and 418th Flight Test Squadrons as well as the 412th Operations Support Squadron. The tour started with a briefing at Ridley Mission Control and then split into two groups. At the 416th FLTS, the attendees got a chance to see a T-38 and F-16 up close and experience what it’s like to fly an F-16 in the simulator. During the briefing they were taught about Auto Ground Collision Avoidance and Auto Air Collison Avoidance systems, which are working to save pilots lives by preventing them from impacting the ground or other aircraft. Auto ACAS is still being tested, but Auto GCAS has already been put to work saving lives. “I didn’t know about the auto mid-air avoidance — I found that really fascinating,” said Ronda Perez, City of Lancaster Parks and Recreation director. But even more inspiring for Perez was the young, female engineer who spoke about it, Becca Mitchell. “This [tour] really gives me a more global perspective of what happens out at Edwards. We’re learning so much and it feels like a true privilege,” said Perez. “I started liking them since the air show … I would like to fly an F-16 and be a fighter,” said Vincent. Lt. Col. Darren Wees, 416th FLTS commander, gave Vincent a day to remember when he showed the eight-year-old future Airman the back seat of the F-16. 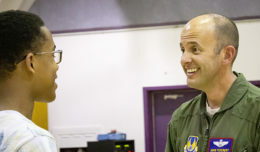 Vincent listened attentively and asked all kinds of questions about being a fighter pilot. 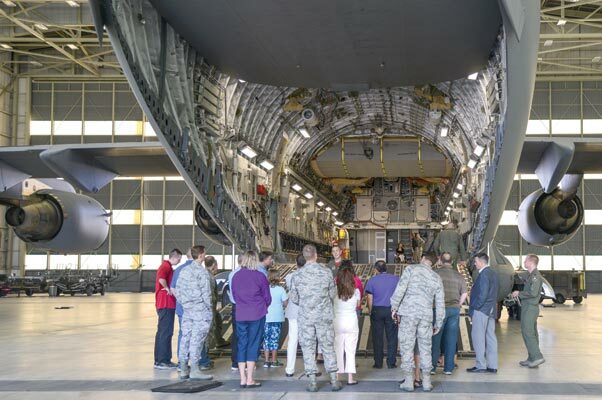 Edwards Honorary Commanders and their military counterparts get a glimpse of a C-17 Globemaster III at the 418th Flight Test Squadron. “He loves to read about fighter jets in books, but to see it and feel it, just solidifies it for him now. He’s riding in the bus saying, ‘best day ever’ and ‘Mom, now I really know I want to be a pilot,’” said Perez. At the 418th FLTS the commanders and their honorary counterparts went in a C-17 and learned how it’s being used to support NASA and the Missile Defense Agency. Videos showed the NASA crew capsule out testing that will be used to safely return astronauts to earth as well as an intermediate range ballistic missile that is extracted from the C-17 in flight and then launched. They also learned about the test parachute program and the Air Force’s newest acquisition, the KC-46. The 412th OSS stop brought the tour to its high point — the tower. First they saw the tower simulator where air traffic controls are trained and then, from the vantage point on the tower cat walk, the honorary commanders saw a stunning view of the base. “What I have seen today and back in May [at Edwards], is problem solving to the highest degree,” said Matt Anderson, Quartz Hill High School principal. Anderson shared that the school has civil engineering, digital electronics and aerospace engineering classes and a developing engineering program. He stated that the “end game” in the curriculum has to be helping the graduates think and problem solve on a higher level. After visiting Edwards, he has modified that end game to say that his students need to graduate with the character trait of poise. “We can give knowledge, we can develop critical thinkers, but if people don’t keep poise under pressure, then whatever you’re doing, you’re going to struggle with it,” said Anderson. By the end of the tour, attendees had a better picture of the entire flight test process and test discipline from planning to execution and data collection. 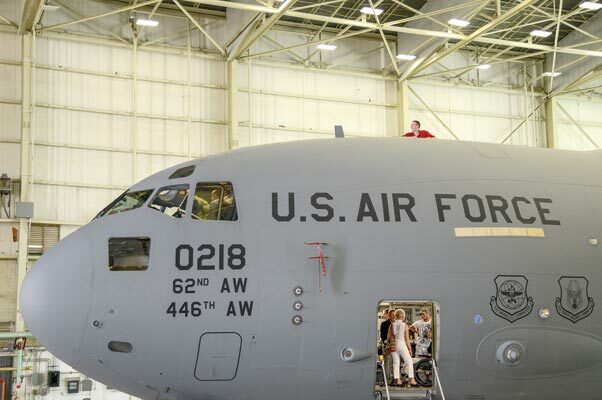 At the 418th Flight Test Squadron the commanders and their honorary counterparts went inside a C-17. Tour attendees can be seen in the side door, cockpit and look-out port in the roof of the aircraft. The primary objective of the Edwards Honorary Commanders Program is to provide Edwards commanders with the capability to develop, promote and maintain a continuous working partnership with the surrounding communities. It helps to familiarize community leaders with Edwards’ operations by pairing them with unit commanders and directors at both social and official functions. 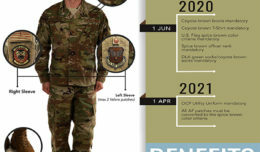 In the next tour, honorary commanders will learn about aircraft maintenance, modification, repair and instrumentation at 412th Maintenance Group.